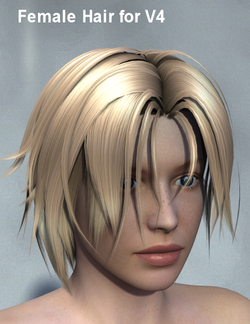 Female Hair for V4 was created by Mark003(Markee) and is an above the shoulders modern free style hairdo. The base file contains 12 mat files for Poser. DAZ Studio users will have to adjust surface settings for the hair to work correctly. This page was last edited on 22 February 2017, at 11:53.